Gemini has done it, a saw that does it all. 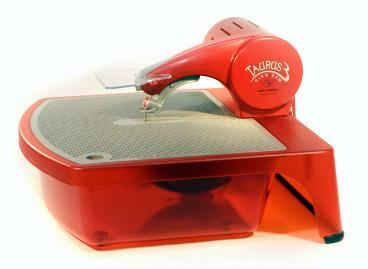 The Taurus 3 Ring Saw (T3) was designed to make cutting glass easier. It has a built in light, flip up face shield, 25% larger work surface. The entire working part of the saw snaps out of the water bath and contains its own water so now it's a portable hand saw allowing you to work with larger pieces. That's not all! It also cuts through dichroic glass, rippled glass, fused glass, stone, tile and plastic. Using it as a hand saw allows you to cut all different angles. 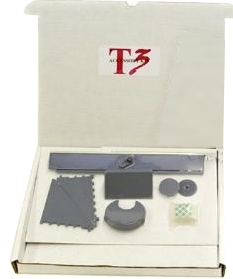 Now includes and instructional DVD plus a Stabilizer Foot to make those precision cuts! 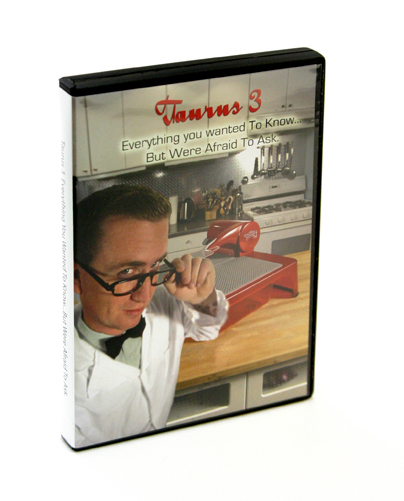 Note: Gemini no longer includes the tube of lubricant as depicted in their DVD. Also the metal clip that used to be included is now attached to the saw. Bottom door ( soak bottom door in water before using to lubricate blade). For the most intricate designs, omni-directional. The Slim blade offers the most intricate cutting ability of all our "Ring Blades". Because of the Slim blade's diminutive size, it has greater ability to create intricate designs and is ideal when cutting non-ferrous metals, but at the same time takes away strength so it is recommended only when its size is beneficial. For internal cuts, omni-directional. The same size and has the same cutting action as the Standard blade, but it gives you the ability to open the blade, slide it through, reattach and make internal cuts with no entry point. 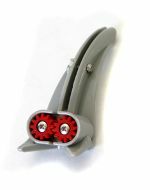 It is made from a stainless steel wire and a coupling all of which are coated with the same high quality process as the other blades. Just for cutting thin Dichroic Glass. This blade has the popular slim blade design with a fine diamond grit that will not chip the delicate dichroic finish! Also works well with iridescent coated glass allowing you to form intricate shapes with perfect edges. Clean edges mean lower temperatures and faster firing times for kiln fired jewelry creating a clean professional look. For dense materials, because of the "tear drop" shape, the Mega Blade is the strongest T3 blade ever and is literally unbreakable. Unlike the Omni-directional blades, it cuts mainly on the front and back, so to create a curve you guide the material around the blade. It is so rigid that it has the ability to damage the saw itself if used improperly. So let the saw do the cutting and don't push the material too hard. The thinnest and fastest of the blades. Its action is just like that of a band saw in that you rotate the material into the blade as you are cutting, but you can do so in the middle of the cut and head off in any direction. This blade can turn on a dime and do very intricate designs once you get used to it. Glass fusers love it. Highly recommended for use with the Super Slicer. The Slicer blade is flat, giving it strength when cutting forward and backward. The new Taurus 3 Ring Saw Blade Stabilizer reduces grommet wear dramatically. It also gives you more control and stability when cutting thicker material. The Stabilizer adjusts easily to accommodate different thickness material. Perfect when using any of the Taurus 3 blades. 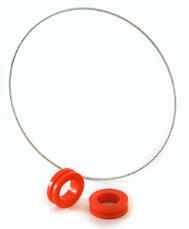 Standard replacement drive belt for both the II.2 and 3.0 Taurus ring saw. Reinforced replacement drive belt for both the II.2 and 3.0 Taurus ring saw. Made especially for slicer blade and speed blade, this belt is probably overkill for all other blades and it costs a little more. It has a Kevlar flocking or criss crossed webbing that holds the rubber together so that it can't easily split. Sold individually. Large rail blue pulley grommet prevents belt from sliding off. This kit is equipped with helpful tools for completing any project, from cutting straight lines to perfect circles and precise angles. Now is the time to give your saw a make-over. 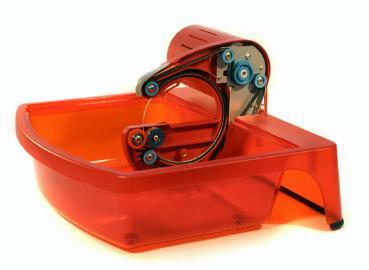 Gemini has put together a rebuild kit to get your saw back to like new condition. 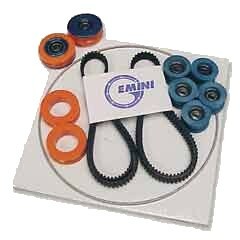 Includes: Standard Blade, 2 Orange Grommets, 5 Blue Pulley Assemblies, 2 Orange Groove Grommet Assemblies and 1 Drive Belt. The incredible Super Slicer is a device that holds pattern bars and other small items needed for slicing in such a way as to allow repeated, perfectly parallel, thin cuts to be made. The slices are repeatable without readjustment or individually with precise adjustment. Although designed for the Taurus Ring Saws, the devise will fit almost all saws including band saws, trim saws, jig saws, etc. 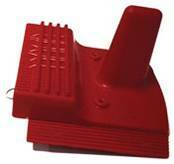 Once you own this simple, easy to use device, you will be amazed at how you ever got by without it. Sold individually. 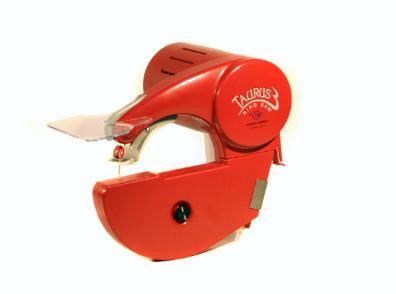 Your Taurus 2 Saw uses five, one inside each yellow and red grommet. Sold in Packs of 2, since the Taurus 2 uses two of these. Also used in the Taurus 3 stabilizer. Sold individually. 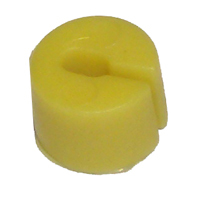 Yellow hole reducer plug.